While critics and commentators may insist that Ginger Baker is “one of the best drummers in rock” or “the greatest of his generation”, Ginger himself disagrees. According to an advert placed in an LA magazine in the Eighties when he was looking for work, Ginger Baker is nothing less than “Acknowledged worldwide as the top DRUMMER ALIVE!”. He masters all styles but claims ownership of only one. “I’m a jazz drummer,” he says. “Rock is just one thing I’ve done. I’ve played blues and African music too. But I’ve always been a jazz drummer.” He’s so much more, of course: a fully rounded musician, composer, player, arranger and bandleader. And a self-confessed Hellraiser too, as the title of his autobiography declared. He is notorious for his willfully abrasive personality — “I know I’m a bit of a monster”, he’s admitted — and his tempestuous relationship with his Cream bandmate Jack Bruce is stuff of legend. He has an unsentimental approach to life, but the sound of the right drummer can reduce him to tears — whether uncelebrated tribal players from Africa or the British or American heroes of his youth, all jazzmen: Phil Seamen, Max Roach, Art Blakey and Elvin Jones. He ended up befriended all four men and earning their respect, a fact that Baker says means more to him than anything else. In the Sixties he wore as many rings on his fingers as Ringo Starr and enjoyed his fair share of pop star adulation to boot. He came to prominence first in the Graham Bond Organization and later in Cream with Bruce and Eric Clapton. That same advert from the Eighties claimed he’d played on “hundreds of albums”, although it’s probably far fewer than that. His post-Cream catalogue includes about 25 titles. There are over a dozen solo releases; collaborations with among many, Fela Kuti; short-lived bands in which he was a founding member, such as Blind Faith, Ginger Baker’s Airforce, Baker Gurvitz Army, BBM and Ginger Baker’s Nutters; and those on which he played as the star guest percussionist, including Hawkind, PiL, Masters Of Reality and DJQ20. While the last-named outfit, a modern jazz ensemble based in Denver, Colorado, where Ginger lived in the 1990s, is the most obscure of them all, it’s one that he claims is “the best band I’ve had”. But whichever recording he contributes to, listeners can be sure of one thing: a dynamic, wildly exciting human rhythm machine with a distinctive and inventive style, and a defiant and indomitable impish spirit. He was born Peter Edward Baker in South London in 1939. He was restless as a child, forever drumming on his desk at school and “banging on the table with knives and forks, driving everybody mad,” until the day he sat behind a drum kit and discovered his life’s calling. Just as fans of Eric Clapton referred to the guitarist as ‘God’ in the Sixties, that’s exactly how Ginger Baker described his mentor, the jazz drummer Phil Seamen, with whom he took tuition — and ended up sharing a similarly wayward lifestyle. Ginger began his career as a teenager in the mid-Fifties with the traditional jazz group, Hugh Rainey’s All Stars (which become the Storyville Jazz Band when joined by trumpeter Bob Wallis.) In the early Sixties Ginger played with Alexis Korner’s Blues Incorporated, where he met Jack Bruce, who said he was the loudest drummer he’d ever heard, and that Ginger “looked like a complete and utter mad man.” They both tasted early fame when they joined the Graham Bond Organization, releasing two albums, The Sound Of ’65 and There’s A Bond Between Us. Departing Bond’s band in 1966, Baker and Bruce teamed up with Clapton, formerly of John Mayall’s Blues Breakers, to form the supergroup Cream — or ‘group’s group’ as it was described at the time. Ginger Baker’s compositions, among his other inestimable contributions, were included as the final tracks on three of Cream ’s four LPs: the five-minute instrumental ‘Toad’, recognized as the first extended drum solo in rock, on Fresh Cream; ‘Those Were The Days’ on the live collection Wheels Of Fire (1968); and his aptly-titled ‘What A Bringdown’ that closed the final set, Goodbye, in 1968. His ‘Blue Condition’, meanwhile, on which he takes lead vocals, ended Side 1 of their second album, Disraeli Gears (1967). Following Cream’s demise, Ginger teamed up with Clapton again in another supergroup, Blind Faith — with frontman Stevie Winwood from Traffic and bassist Rich Grech from Family. Ginger found a meeting of minds in Winwood, and in Grech the freedom to express himself within a rhythm section unsullied by an ongoing personal feud with the bassist. Despite this, the band lasted mere months, but their only album, Blind Faith, was an enormous success, reaching No.1 on both sides of the Atlantic. Ginger’s epic 15-minute ‘Do What You Like’ — an accurate summation of his worldview — closed the proceedings. Prior to Cream’s brief reunion in 2003, Baker also played with Bruce on the bassist’s solo album Cities Of The Heart in 1989, and the pair joined forces again alongside guitarist Gary Moore for the power trio BBM, yielding one UK Top 10 LP, Around The Next Dream, in 1994. Ginger’s lifelong love affair with African rhythms came to the fore in 1970’s jazz-rock ensemble, Ginger Baker’s Air Force, which included his old friend Graham Bond and for a while his hero Phil Seamen — until Seamen, contrary as his star pupil, declared that the music was “shallow’ and “too bloody loud.” The band’s self-titled debut was a live recording from the Royal Albert Hall and a modest chart success. The follow-up, II, issued the same year, was a studio set featuring a mostly different line-up, but with Bond and Denny Laine from the Moody Blues providing the continuity. In the early Seventies Ginger broke with the rock world to explore African music at its source. He flew to Nigeria, where he headed straight for Fela Kuti, the multi-instrumentalist and revolutionary prophet of Afrobeat music and Nigerian politics. Ginger was in awe, and for a while at least the feelings were mutual. (Although relations between the pair would sour when Baker began playing polo with the country’s power elite, Kuti’s avowed enemies). Ginger spent six years in Nigeria, two of which he invested into building a recording studio in Lagos — which he was forced to abandon when armed gangsters, incensed at his ‘colonial’ intervention, attacked his compound. He fled the country. The adventure produced some wonderful music: Fela’s albums, Why Black Man Dey Suffer, featuring just two lengthy extemporizations and only released in Nigeria (1971), Live! (1972), and Ginger’s own Stratavarious (1972), that was reissued as Do What You Like in 1998. Ginger has continued with his African obsession throughout his career, and for further triumphant tribal workouts — without Kuti — see, for example, African Force (2001) and African Force: Palanquin’s Pole, an album recorded live in 1987 but not issued until 2006. Upon his return from Lagos, Ginger resumed his relationship with heavy rock, this time with synthesizers in the mix, when he formed Baker Gurvitz Army with the Gurvitz brothers Paul and Adrian, previously of The Gun. The band recorded three albums, Baker Gurvitz Army (1974), Elysian Encounter (1975) and Hearts On Fire (1976). But with substance abuse, a long-term struggle for Ginger, raising its ugly head once more, he escaped the band and Britain again to set up home in an isolated mountain top retreat in Italy. Ginger released nearly a dozen solo albums over the next two decades, on almost as many different labels. African rhythms were often but not always upfront, and there were several returns to rock. 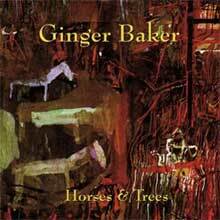 Among his most consistent solo release is his fourth, Horses & Trees. Issued in 1986, it saw producer and bassist Bill Laswell — who brought Ginger back from virtual retirement in Italy to guest on Public Image Ltd’s Top 20 Album of the same year — help stir up a heady brew of dance-orientated jazz instrumentals. There’s also the similar Middle Passage (1990), again with Laswell. Not to be overlooked either are Ginger’s mid-Nineties repatriation to major-label status for two albums on Atlantic Jazz, Going Back Home (1994) and Falling Off The Roof (1995). 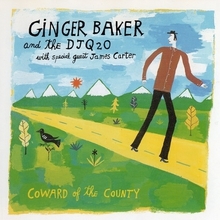 Another definite solo highlight is Coward Of The County (1999), credited to Ginger Baker and DJQ20, in which he joins trumpeter Ron Miles and bassist Artie Moore for a series of adventurous contemporary jazz extemporizations that bring free jazz, hard bop and rock elements into the broiling mix. In 1980, between his solo jazz excursions, Ginger drummed with space rockers Hawkwind. Guitarist Huw Lloyd-Langton said: “Ginger fitted the band like a glove. His style was just right for it.” The result was Levitation, the band’s tenth album, which harked back in sound to the triumphs of their self-titled debut of a decade before. But Ginger left shortly after its release. Another one-off collaborative venture that drew critical accolades, and on which Ginger was co-writer as well as drummer, was the US stoner rock power trio Masters Of Reality, whose Sunrise On The Sufferbus was released in 1992. 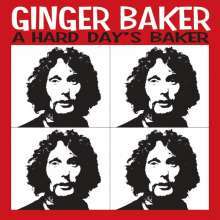 Ginger Baker’s most recent album, Why? (2014), is his first studio work for 16 years and sees him return to his first love, jazz. This well-received set revisits several cuts from previous albums alongside new compositions, and is rich as ever in texture and wild invention, with African rhythms once again occupying centre stage. It’s an intriguing and engaging album — if you’re not scared off by the great man’s defiant close-up stare that graces its unflinching cover. Ginger Baker will forever be best known for his influential drum work as part of British blues-rockers Cream. But as most serious admirers of the drummer know, Baker subsequently tackled countless other styles. Case in point, African Force. Joining Baker is a supporting cast of percussionists with a tribal drumming background, and expectedly, this style is reflected throughout the album. In fact, it sounds very comparable to David Byrne's solo albums and also Paul Simon circa his Graceland period, especially on such tracks as "Brain Damage" and "Sokoto," while the over-epic twelve-minute album-closing title track adds some funk bass to the mix. 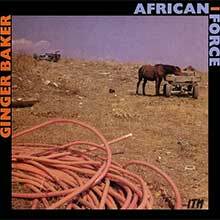 For those who think that all of Baker's work sounds like Disraeli Gears, you're in for quite a surprise with African Force. Though he may be physically frail due to chronic obstructive pulmonary disease (COPD) and osteoporosis, Ginger Baker in his mid-seventies is still a drummer to be reckoned with. Why?, his debut offering for Motema Records -- and his first studio outing in 16 years -- features him in the company of his touring quartet of bassist Alec Dankworth, saxophonist Pee Wee Ellis, and percussionist Abas Dodoo. The program is pure jazz. Two tunes here -- the modal "Ginger Spice" by Ron Miles, and his own blues "Cyril Davies" -- are revisioned workouts from his Coward of the County album, while his Algerian-tinged "Ain Temouchant" dates from his trio with Charlie Haden and Bill Frisell on Goin' Back Home. "Aiko Biaye" is a Nigerian folk song that was originally adapted by Ginger Baker's Air Force. Only the set's closing title track is "new." As is to be expected, drums are at the heart of every tune here. The interplay Baker enjoys with his longstanding percussionist Dodoo is down to the level of pure musical instinct. Circular rhythms go hand in hand with syncopation -- check the excellent reading of Wayne Shorter's mysterious modal blues "Footprint" as well as "Aiko Baye." One has seldom heard Ellis play it as straight as he does here. Despite his pedigree with James Brown and Van Morrison, Ellis sticks to his love of John Coltrane and Sonny Rollins throughout. His playing is physical yet economic and imaginative; particularly effective is his solo atop the interlocking rhythmic grooves on "Ginger Spice" and his big-boned, songlike break on Rollins' Caribbean-flavored stomp "St. Thomas." Baker's playing is spot on throughout. He showcases imagination and swing rather than firepower on Ellis' fine "Twelve and More Blues," where he first engages in fluid call-and-response with Dankworth, and then in an elastic dialogue with Dodoo. Likewise, his longer break on "St.Thomas" offers the spirit and creativity of his earliest work on the British jazz scene, albeit with a more seasoned textural flair. Closer "Why?" is the only place where heat and dynamic bubble over. Hinting at his work with Fela Kuti, a chanted female vocal chorus brings elements of bubbling Afro-funk to the fore even as Ellis quotes from "Wade in the Water" in the melody. It's a dramatic closer. Why? signals a welcome, rootsy, and classy return for Baker to recording, despite his notorious "Beware Mr. Baker" grimace in the cover photo. 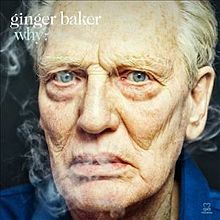 During the early '90s, Ginger Baker gradually established his reputation as a genuine jazz musician, proving that he was no rocker who was merely dabbling. Of course, anyone familiar with Cream will realize that he was among rock's jazziest drummers, but his series of records with Bill Frisell convinced many doubters of his musical merit. On one of his tours, he happened to hear trumpeter Ron Miles and bassist Artie Moore play in Denver. Impressed with the two musicians, he relocated to Colorado and assembled the Denver Jazz Quintet-to-Octet. The DJQ20 is a shifting group of musicians that has Baker, Miles, and Moore at its core and, as it turns out, their elasticity is what gives them strength. For their first effort, Coward of the County, they're joined by a saxophonist, along with a variety of local Denver musicians, and the results are startlingly fresh. Using hard bop as a foundation, they're unafraid to venture into challenging territory, where they pull together free, funk, and rock into unpredictable combinations. Baker wrote two of the songs, including the opening tribute, "Cyril Davies," but the remainder of the record is devoted to originals by Miles, who proves himself to be an inventive composer, capable of lovely lyrical ballads ("Megan Showers") and experimental jazz. Often, Coward of the County veers into unpredictable territory -- witness how the funky fusion on "Ginger Spice" moves into dissonant improvs, how the title track is colored by pedal steel and organ, or how "Daylight" is a series of surprises, as its gentle beginnings are submerged by waves of distorted guitar that fade back, revealing darkly beautiful textures. Not only are the compositions challenging, they're delivered with ease by the group, which are remarkably empathetic and graceful. In fact, it's a testimony to Baker's skills as a leader that he never dominates, preferring to let all the parts weave together to create a full, rich sound. And by doing so, he has made Coward of the County, in a way, a showcase for Miles, since his compositions become the focal point. They signal a young writer of considerable skill, ambition, and talent -- and he's not a bad trumpeter, either. Bill Laswell's musical career has been a highly collaborative one. Almost every new release from solo excursions to a variety of mercurial group projects finds him engaged with a notable instrumentalist from the arenas of jazz, electronica, funk, hip-hop, reggae, and world music. It's not that he seems dominating as a musician per se, but the results do typically bare the producer's singular aural stamp. Horses & Trees is no exception. Persuaded by Laswell to continue working throughout the second half of 1980s, drummer Ginger Baker produced some of his most stimulating collections, not least of which were the Laswell produced Middle Passage and this 1986 set. The drummer is rock-solid throughout, which means that most of the compositions become a showcase for an impressive lineup of guest musicians that reads like a list of the Bill Laswell all-stars. Even when pared down to an all-rhythm trio on "Mountain Time," Baker, though undeniably effective, remains the big beat behind Daniel Ponce and Aiyb Dieng's percussion display. That does little to change the fact that this is one of the most enjoyable albums Baker (or Laswell) has been involved in. "Uncut" finds the likes of Bernie Worrell, Shankar and Laswell in fine form, taking solos like a jazz combo. "Dust to Dust" is the only piece composed solely by Baker (he shares credits everywhere else) and is the most stunning of the set with a repeated section that sounds like an alien hoe-down with world music undertones. Laswell alumni and hip-hop pioneer Grandmixer D.ST (of "Rock It" fame) returns, delivering slashes from his turntable that provide the sort of genre-bending texture Laswell is so fond of. Baker, while never caught stealing the show on any track, looms large. On Horses & Trees, his big beat pulls the greatest weight. This collection of live material comes from the official bootleg series,and has been re-mastered with seriously improved packages from the original releases. Includes the tracks 'I Got The Answer', 'Free Kinks', 'Sunshine Of Your Love' and more!